Zurich’s storied Dolder Grand hotel boasts an art collection befitting of a heavy-hitting gallery. The latest addition to owner Urs Schwarzenbach’s enviable collection is a new restaurant by the Swiss artist Rolf Sachs. Inside the freshly minted Saltz – a portmanteau of the English and German words for ‘salt’ – Sachs has conjured an alpine adventure that dabbles on the right side of chalet kitsch, with Swiss railway clocks, postcards, mountain-rocks, climbing ropes and karabiners. The restaurant’s most coveted seats are – quite unusually – not found beside the panoramic windows, which offer sweeping views over the city and mountains beyond. 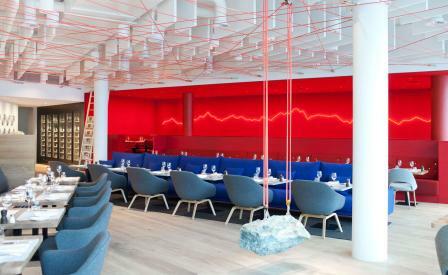 Instead, diners might be lured to the scorching Red Corner, decked out with special-edition Jean Prouvé ‘Fauteuil Direction’ chairs and illuminated by a neon work that recalls the Alps. Oak flooring and soft banquette seating divide the space while opposite, a crystalline wall installation made from salt offers a cooler respite. The all-day dining menu includes an eclectic mix of global cuisines, catering to the hotel’s well-heeled, globetrotting clientele; we recommend the signature absinthe and flamed pear ‘128’ cocktail to get you started.